The classic story is brought to life in true pantomime style, refreshed and enriched with laugh upon laugh! Brimful of comedy, this hilarious new version takes some beating! Original material and inventive ideas live hand in hand with the traditional story and essential pantomime fun. 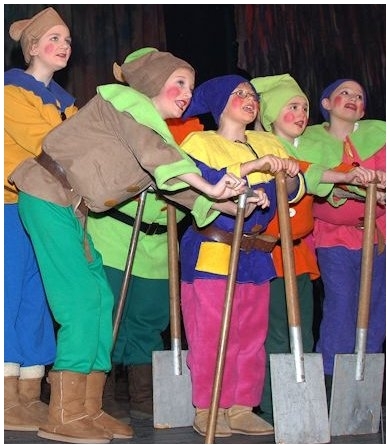 The Seven Dwarfs, often (but not always) played by children, have distinct comical characters, each providing a small speaking role, ideal for youth theatre groups, dance academies or societies wishing to nurture young talent. A brand new, original comic two-some, Justice Quill and his idiotic scribe, Scribbles (acting as legal advisors to evil Queen Avarice) add to the hilarity, irony and anarchy whilst, unusually for this title, there are stacks of optional possibilities to feature the Chorus. Cleverly avoiding the need for a large number of scene changes, this script lends itself to straight-forward staging, whilst offering boundless opportunities for the more ambitious. Many productions of this script have won NODA and drama federation awards, including Wickham Bishops Drama Club (NODA “Best Pantomime”)! We also offer a version of this script for schools or youth theatre groups (slightly simplified and with added lines for Chorus members). For a Reading Copy of this, please select Snow White & the Seven Dwarfs and specify “youth version” in the message box on the order form. Let us introduce ourselves. I’m Brainy. He’s the clever one. And I’m Smiley. He’s the happy one! (To the other 5:) Come on, your turn – and keep it short! He’s one slice short of a loaf! (Shy and embarrassed at meeting a girl) I’m … oh, gosh … I’m Blushful. Yes, he’s short of a tissue! (Looking at her hand) Err! I see what you mean! He’s always short of sleep. And, if you must know … I’m Grumbly. And he’s got a short fuse! So, do you think I could stay here with you? In that case, it’s a “yes”! Why, thank you – and I promise you won’t go short! … Oops, sorry! DANCERS: Featured in musical numbers as desired. Also play the Forest Animals in some scenes. "...The tale of Snow White & the Seven Dwarfs needs no introduction, but the writer of this pantomime, Alan Frayn, has produced a wonderful adaptation that sticks closely to the original story and also introduces some marvellous new characters, together with typical pantomime situations in a delightfully fast-moving show." "...The Riverside Players, under the skillful direction of ‘Tricia Barclay, gave a first class production of Alan Frayn's well-crafted Snow White and the Seven Dwarfs, thrilling their enthusiastic and vocal audiences at the Village Hall. 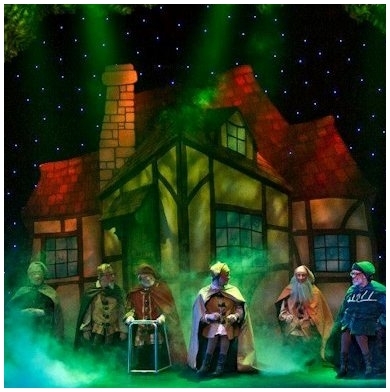 This panto was visually pleasing, full of life and energy, with great comedy routines." "...We always go for a professional script. My experience of scripts written locally or by members of the company is not good, so I like to keep to the tried and tested. For the past 2 years [now 11!] we've used Alan Frayn of Stage Right Creative (whom the NODA SW Representative for pantomimes believes to be the best script writer for amateur groups in the UK) ... I agree with him! This year was to be no exception."